Declassified satellite images provide an important worldwide record of land-surface change. With the success of the first release of classified satellite photography in 1995, images from U.S. military intelligence satellites KH-7 and KH-9 were declassified in accordance with Executive Order 12951 in 2002. The data were originally used for cartographic information and reconnaissance for U.S. intelligence agencies. Since the images could be of historical value for global change research and were no longer critical to national security, the collection was made available to the public. Keyhole (KH) satellite systems KH-7 and KH-9 acquired photographs of the Earth’s surface with a telescopic camera system and transported the exposed film through the use of recovery capsules. The capsules or buckets were de-orbited and retrieved by aircraft while the capsules parachuted to earth. The exposed film was developed and the images were analyzed for a range of military applications. The KH-7 surveillance system was a high resolution imaging system that was operational from July 1963 to June 1967. Approximately 18,000 black-and-white images and 230 color images are available from the 38 missions flown during this program. Key features for this program were larger area of coverage and improved ground resolution. The cameras acquired imagery in continuous lengthwise sweeps of the terrain. KH-7 images are 9 inches wide, vary in length from 4 inches to 500 feet long, and have a resolution of 2 to 4 feet. The KH-9 mapping program was operational from March 1973 to October 1980 and was designed to support mapping requirements and exact positioning of geographical points for the military. This was accomplished by using image overlap for stereo coverage and by using a camera system with a reseau grid to correct image distortion. The KH-9 framing cameras produced 9 x 18 inch imagery at a resolution of 20-30 feet. Approximately 29,000 mapping images were acquired from 12 missions. The original film sources are maintained by the National Archives and Records Administration (NARA). Duplicate film sources held in the USGS EROS Center archive are used to produce digital copies of the imagery. High performance photogrammetric film scanners are used to create digital products at 7-micron (3,600 dpi) or 14-micron (1,800 dpi) resolution for black-and-white (B/W) images. Color images are limited to 14-micron resolution due to file size. High Resolution Digital Products are of photogrammetric quality and files are stored in TIFF format. The scanning process does not apply geocorrections. * USGS EROS scans products in 9 1/2 inch overlapping sections and the number of files will vary based on the length of the image. The actual file size may fluctuate due to image data, surrounding metadata, and the addition of the USGS logo. 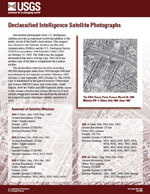 Coverage Maps indicating the availability of Declassified 2 products are available for download. EarthExplorer can be used to search, preview, and download existing digital files at no cost. For all other imagery, an order will need to be placed to scan the film at $30.00 per frame. The collection is located under the Declassified Data category as Declass 2. Declass 2 browse images should always be previewed online before placing an order to verify area of interest and to check for cloud cover. Below are data or web applications associated with this product.